We live in a time when couples have a huge range of choices about the words and rituals they can choose from in planning their wedding ceremony. 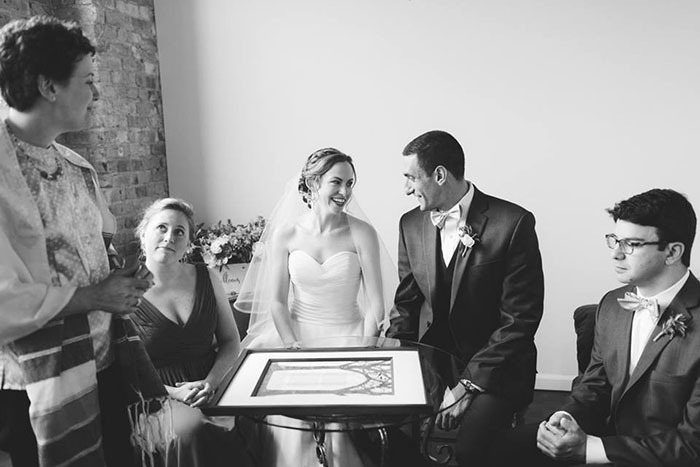 If you’re working with a rabbi, cantor or officiant of another faith, s/he will probably provide you with some specific ceremony texts and outlines to consider, as well as ideas for incorporating specific elements you may want. Many clergy are open to suggestions or changes from the specific words and rituals they typically use, though some are more flexible than others, so it’s a good idea to find out early on if the person you’re working with is a good match for your needs. We are often asked for sample wedding ceremonies, so we thought this page would be useful to include. Finally, we also have a PDF you can download that includes many poems and readings from different traditions; suggested orders of service; and examples of short definitions of Jewish ceremonial elements designed for use in wedding programs. You can also always ask an officiant you’re considering working with if they would be willing to show you examples of ceremonies or rituals that they have used in the past.